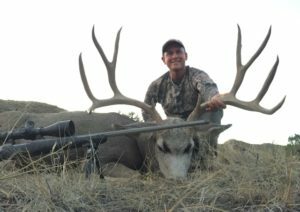 If you would like to go Mule Deer hunting this year or next, and for a very reasonable cost, this is your opportunity! We always like being the first to introduce a new operation to our numerous clients. 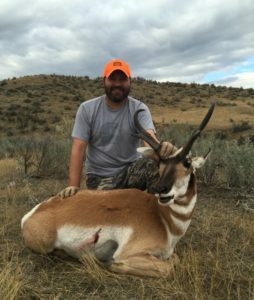 And we like it even more when one of our premiere Wyoming Outfitters tells us he has a hot new outfitter for us to work with. He told us the new guy practically walks on water. Our older outfitter says this nearby rancher friend of his kills mule deer averaging 190 Inches or better. Oh- but a couple years ago the little one only made a measly 188! Now before you go off frothing at the mouth, the outfitter only takes 3 trophy hunters a year, and he is full already for 2017 and maybe for 2018. You might have a slight chance for 2018 or 2019. If truly interested , then call us , but do not get too excited until we find out if we can get you in with him. But what else the outfitter does have are very big Management Mule deer- deer averaging in the 160’s to 170’s. That quality of deer in many places would be considered trophy bucks. And he has a drop dead price of only $3500 for his management hunt! Because he wants to grow giants, there are good numbers of management bucks with plenty of age and mass on them. These make impressive trophy mounts, believe us. They will run 24 to 28” wide, have mass and height and will catch your eye for sure. And getting a license is almost a sure thing! Plus he is normally 100% kill on these hunts. DEER LICENSES: The draw odds for a Region C buck tag at the Regular price level ($312 plus $14 application fee) are about 40%. However for $140 more ($552 total plus $14 app fee ) your odds jump to virtually 100%. Meaning you can plan on applying by May 31 knowing that at the Special level you can be almost sure of drawing. In general management mule deer here will be heavy antlered 3X4’s, 3X3’s and older class 4X4’s who will never reach the 190 level. It is best to cull out those genetics now. These will typically be 4 and 5 year old bucks. WE do not want these older deer breeding and passing on their genes. This outfitter/rancher has no web site and no fancy brochures to show you. 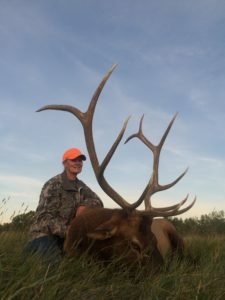 What he does have is 55,000 acres of choice habitat in one of our most favorite areas in Wyoming for deer, Region C. We ourselves have hunted and killed a significant number of big deer in the Region C area. His ranch has Muleys, antelope, elk, some whitetails, some bear. Rifle or bow. A MAX OF 6 GUYS IN CAMP AT ONE TIME. 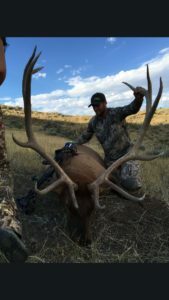 Guiding, lodging and meals are all included in his management price of $3,500. You must apply by May 31 to draw your Region C tag. We w ill guide you through the process if you need it. . LODGING: Ranch type lodging, or if you prefer, use the homestead cabin for a rustic feel and walk 200 yards for showers to main ranch house. MULE DEER- MANAGEMENT: REGION C. These are big deer- They would usually be a trophy elsewhere. A steal at $3500, but only 3 days long which has proven to belong enough every year! Average is 160-170”!!! Guiding is 2X1. He has 3 openings for Management rifle for 2017. ANTELOPE– Good goats- average is 65-78”. 3 DAY HUNTS, 2X1 AND INCLUDE GUIDING, MEALS AND LODGING. Price is $2200. Apply for Areas 16 and 17. He has openings for 3 rifle antelope and 4 bow hunters. 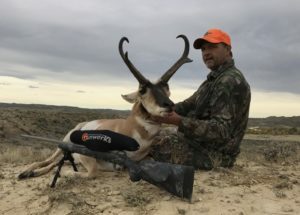 An Antelope tag must be applied for by May 31. Regular price license is $272 plus a $14 on line application fee. Draw odds for the Regular price license are well over 90%! No need to apply at the Special level. ELK: Area 2- You will need 10 points to draw. In 2015 took a 390; in 2016 a 387. Truly awesome if you can draw it. $8500 for 5 days. Guiding is 1X1 or better, meaning often you will have multiple guides. Apply by Jan 31. 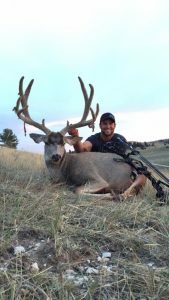 MULE DEER – TROPHY HUNTS $7500. YOU MUST SPEAK WITH US IF INTERESTED- AND IT COULD BE SEVERAL YEARS OR MORE TO GET YOU IN! WE ARE HUNT NATION –YOUR PRIME ADVENTURE SOURCE.